Open Coaching Session - Sunday 28th April at 2:30 until 4 p.m.
Steph will be holding an open coaching event on Sunday 28th April for members and visitors. 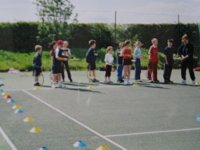 LTA "Tennis for Kids" Scheme - starting 4th May at 3 p.m. Contact Steph on 07779421345 for details or click here. 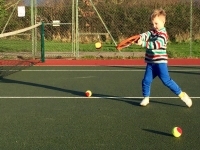 This year, lessons are open to kids aged between 5 and 8, and will be available from the coach at Church Eaton starting on Saturday 4th May at 3 - 4 p.m. For just £25 every child will receive 6 high-quality lessons, developed by experts at the LTA, as well as a special Tennis For Kids Babolat racket, ball set, and personalised T-shirt. 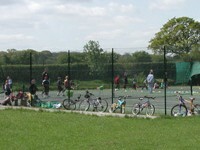 There will be a follow-on offer to encourage pupils to keep playing at the venue after the course is complete. 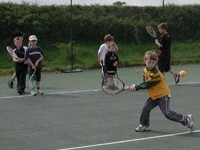 Regular Junior Coaching Sessions - Saturday mornings. Following the open day Saturday 4th March 2017 three groups were established for Juniors on Saturday mornings at 10:45-11:30, 11:30-12:15 and 12:15-1. Since then another at 2 p.m. Please contact Steph on 07779421345, email her if you would like coaching at Church Eaton but have not yet joined a group. Children, adults, rusty racquets welcome. Private coaching also available by arrangement with Steph. Regular Adult Coaching Sessions - Sunday mornings. Steph is planning on starting a Sunday morning session for adults from 10 a.m. till 11 a.m. on a more flexible basis, attend when you can.